Kildavnet (Cill Damhnait) is located on the south-eastern shore of Achill Island, overlooking the waters of Achill Sound. The placename literally means 'the small church of Davnet' and refers to the 7th Century saint Dympna who built a small church here. It is thought that the present remains of a small church at Kildavnet were built on the site of the original. Parts of the present remains are thought to date from the 12th Century, though there has been much renovation since then. The present structure served as a Catholic chapel in the 19th Century. Adjacent to the chapel is the ancient graveyard of Kildavnet which contains many unmarked graves of famine victims (1845-1848) as well as a memorial to the victims of the Clew Bay disaster of 1894. Just outside the walls of this graveyard, by the shore, is a Holy well. 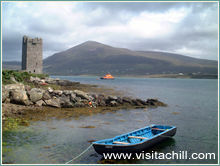 Kildavnet Tower is located a couple of hundred metres along the shore from the ancient church. It is a fine example of a 15th Century Irish tower house. This three storey building stands about 40ft (12m) tall and has buttress fortifications at the top. It was probably built by the O'Malley Clan, a local ruling family, in about 1429. However it is better known as the home of its most famous tenant, the legendary pirate queen Granuaille (Grace O'Malley, 1530-1603). 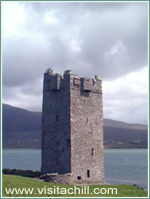 The Tower stands at a strategically important spot, guarding the waters of Achill Sound which links Clew Bay to the south with Blacksod Bay to the north. During the time of Granuaille it was one of several such strongholds that she controlled. Another was at Clare Island, allowing her to control the waters of Clew Bay as well as the seas off the west coast of Mayo.